The roughly octagonal pores in zeolite SSZ-13 are like stop signs for carbon dioxide, capturing molecules of the greenhouse gas while apparently letting other substances through. The material could prove to be an economical smokestack filter. Researchers from the National Institute of Standards and Technology and the University of Delaware are working together to reduce greenhouse gas emissions. They believe a material called a zeolite, which has octagonal “windows” between its interior pore spaces, might help reduce carbon dioxide coming from factory smokestacks far more efficiently than current models. Zeolites are highly porous rocks—think of a sponge made of stone—and while they occur in nature, they can be manufactured as well. Their toughness, high surface area (a gram of zeolite can have hundreds of square meters of surface in its myriad internal chambers) and ability to be reused hundreds of times makes them ideal candidates for filtering gas mixtures. If an unwanted molecule in the gas mixture is found to stick to a zeolite, passing the mixture through it can scrub the gas of many impurities, so zeolites are widely used in industrial chemistry as catalysts and filters. Using neutron diffraction, the team determined that SSZ-13’s eight-sided pore windows are particularly good at attracting the long, skinny carbon dioxide molecules and holding onto their “positively-charged” central carbon atoms, all the while allowing other molecules with different shapes and electronic properties to pass by unaffected. 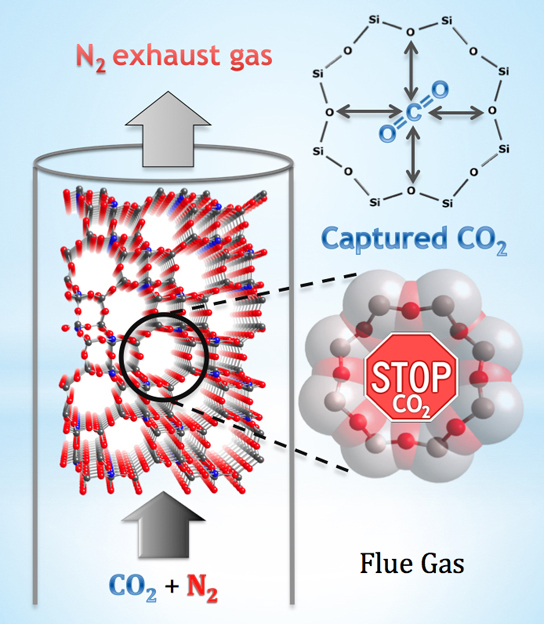 Like a stop sign, each pore halts one CO2 molecule—and each cubic centimeter of the zeolite has enough pores to stop 0.31 grams of CO2, a quantity that makes SSZ-13 highly competitive when compared to other adsorbent materials. Brown says a zeolite like SSZ-13 probably will become a prime candidate for carbon scrubbing because it also could prove more economical than other scrubbers currently used in industry. SSZ-13’s ability to attract only CO2 could mean its use would reduce the energy demands of scrubbing, which can require up to 25 percent of the power generated in a coal or natural gas power plant. Brown says his team is still collecting data to confirm this theory, and that their future efforts will concentrate on exploring whether SSZ-13 is equally good at separating CO2 from methane—the primary component of natural gas. CO2 is also released in significant quantities during gas extraction, and the team is hopeful SSZ-13 can address this problem as well. 2 Comments on "Researchers Study Zeolite for Filtering Out Carbon Dioxide"
Hi!really this article is good one.this news is very useful in my project…..